Can’t believe it is June already! The last few months have been a roller coaster for me personally and I’m glad all that uncertainty is behind us and my life is back to normal. The funny thing is, it took me 4 months to realize what my normal is and how much I like it! Anyways, more on that later now for the fun stuff I did over the weekend. As you’ve already guessed this year my water garden sports a Lotus instead of the usual Water Lily! I tell ya, around here water lily is so last year. 😉 More good news, I finished my cane chairs! I know a few of you have been after me to finish those and boy did I have to pull a late nighter to wrap that up! But didn’t get a chance to take the “After” shots so you’ll have to wait till next week for the reveal. On the garden front, I transplanted my sun flowers seedlings to our backyard bed to make a sunflower border against our neighbor’s fence. Keeping my fingers crossed that the bunnies will spare at least these. I’m seriously starting to get wary of those pesky creatures after they feasted on all my lilies, 2 years in a row! American or Yellow Lotus which is a perennial and is quite hardy. I had been planning on trying to grow the Sacred Lotus for some time and finally took the plunge last week by ordering a tuber on Ebay. Any guesses as to where it was being shipped from? Nope not India or anywhere in Asia or even Florida…….good ol’ Jersey! Kinda strange we were in Jersey all these years and didn’t even think about getting it back then! 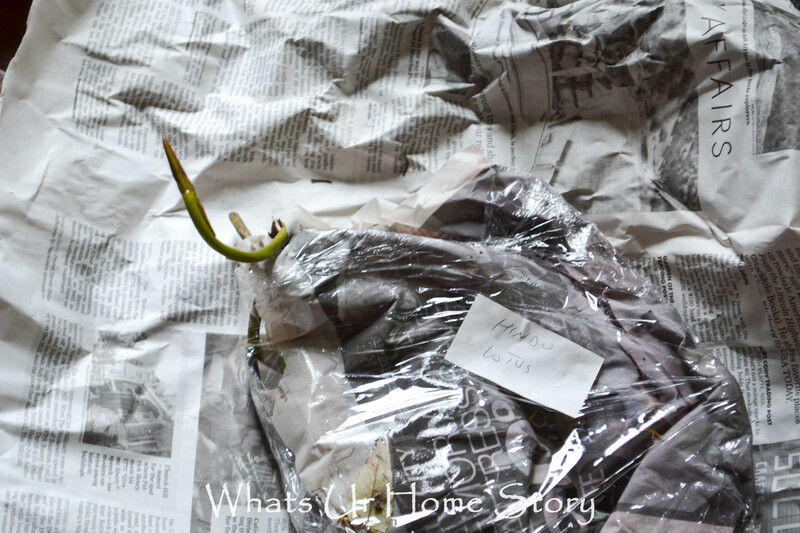 In a matter of days the plant was delivered in a carefully wrapped package. Got to give the seller redrick49 100% marks for the shipping and handling quality. 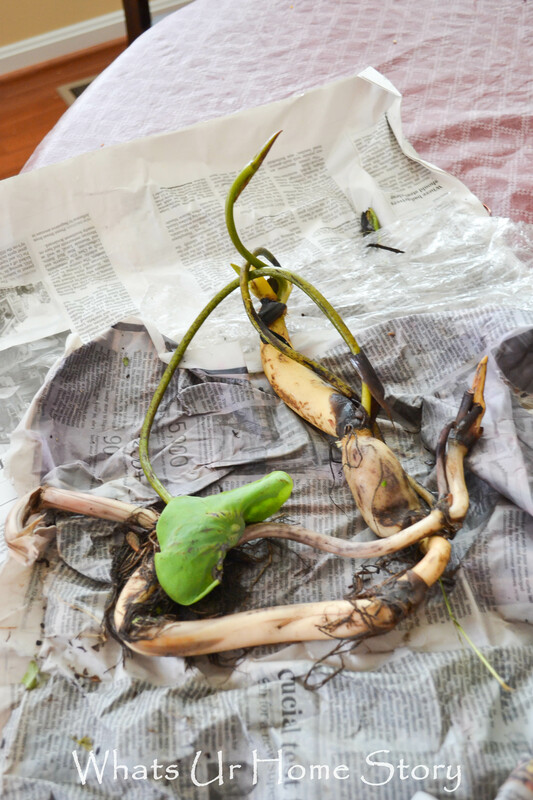 Inside was the tuber with 2 leaves sprouting from 2 growing tips. The Lotus tuber is very gentle and you have be extra careful when handling it. 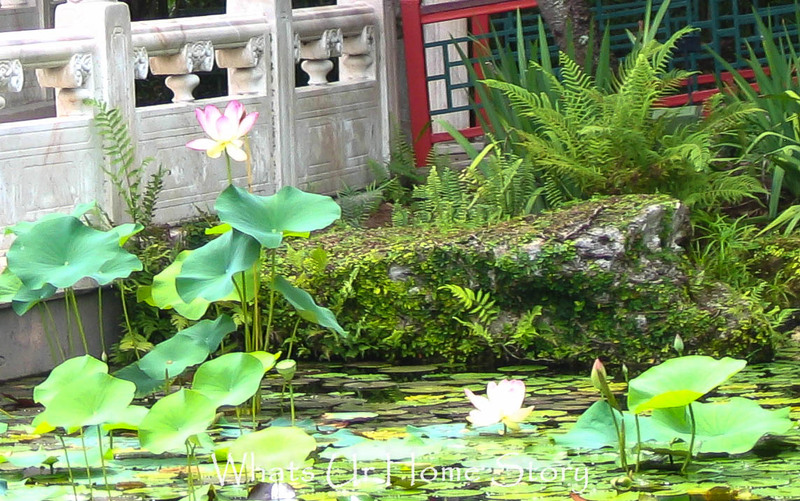 The main difference between planting a water lily and a lotus is that the lotus needs a bigger planter. They are vigorous growers and will fill up the container pretty soon. So I ended up using my plastic half barrel that used to house my entire water garden solely for the Lotus. Fill up the container, a half barrel or a 15 gallon rope bucket is ideal, with 2 inches of garden soil. Do not use potting soil as it will float up. Add fertilizer pellets or in my case I just added a layer of my usual garden fertilizer. Add in more garden soil so that is about 5-6 inches deep. With you hand dig a trench the size of your tuber across the container. 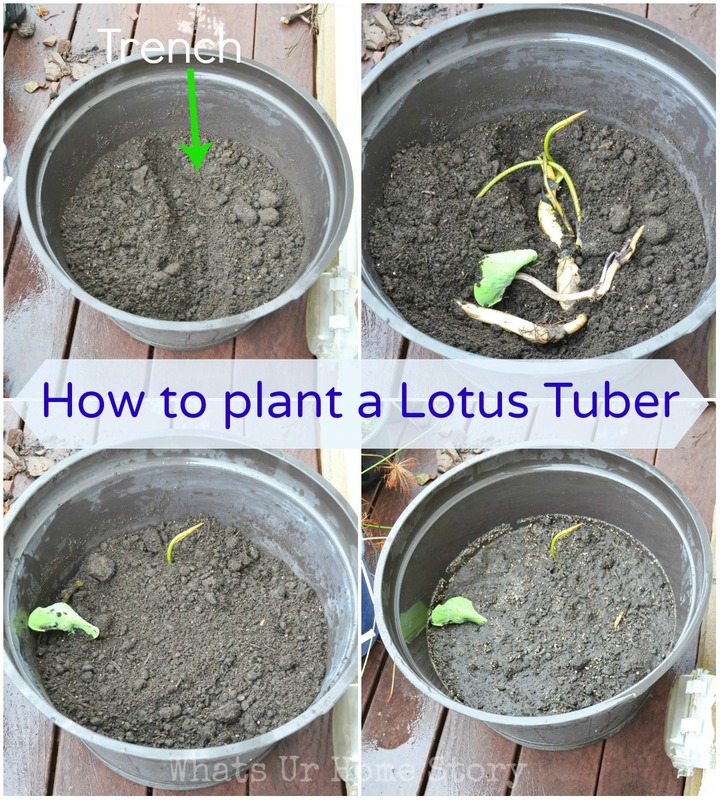 Gently place the tuber in the trench with the growing tips facing up. You can place a small rock or stone on the non-growing part of the tuber to weigh it down (optional, I didn’t do it). Cover with more soil. Now the soil level should reach up to slightly more than half of the container. Add water to your container slowly in batches. ie. pour some and wait for the soil to settle. 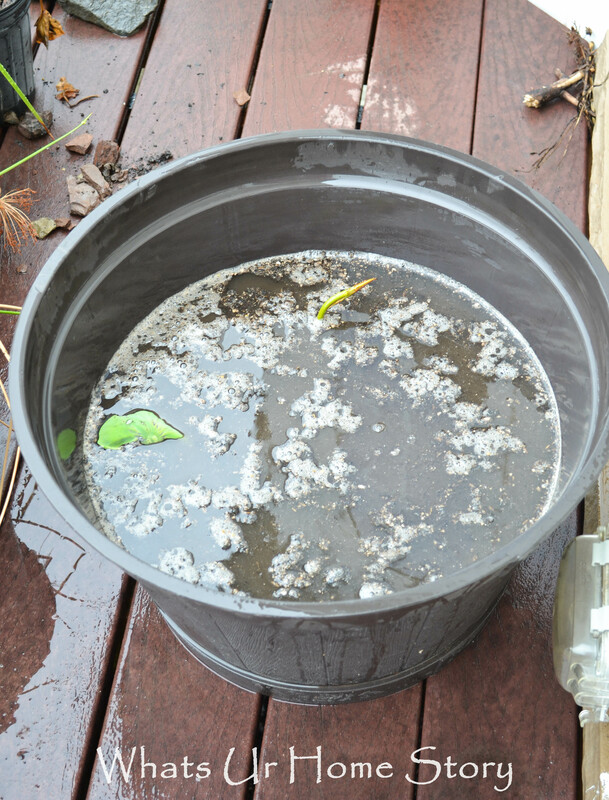 My soil was pretty dry and soaked up almost all the water the first 2 times (see the last pic). Fill up the container so that the water level is 3-4 inches above the soil. I didn’t fill mine up all the way as were were expecting heavy rains. Sure enough Mother Nature filled up the container for me in a matter of minutes. To be safe and not to end up with a mosquito breeding heaven I added a piece of Mosquito dunk to the water. As and when the water evaporates add more water to keep the level up. Wait patiently, pray, do everything you can so that it works out as planned and you’ll end up with this! Anyone grown a Lotus? Any advice for me? 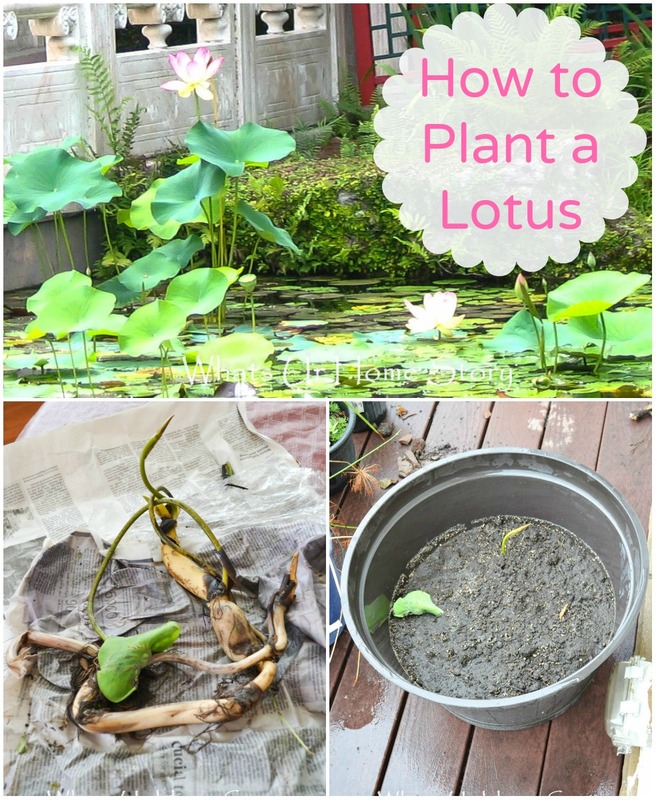 PS: You can also grow Lotus from seeds. That plan is on the cards for next year. « A Country Garden Like No Other! Can’t wait to see the lotus in bloom. Fingers crossed! Vidya, can’t wait to try this!!! This is what I have. Got it from Walmart.